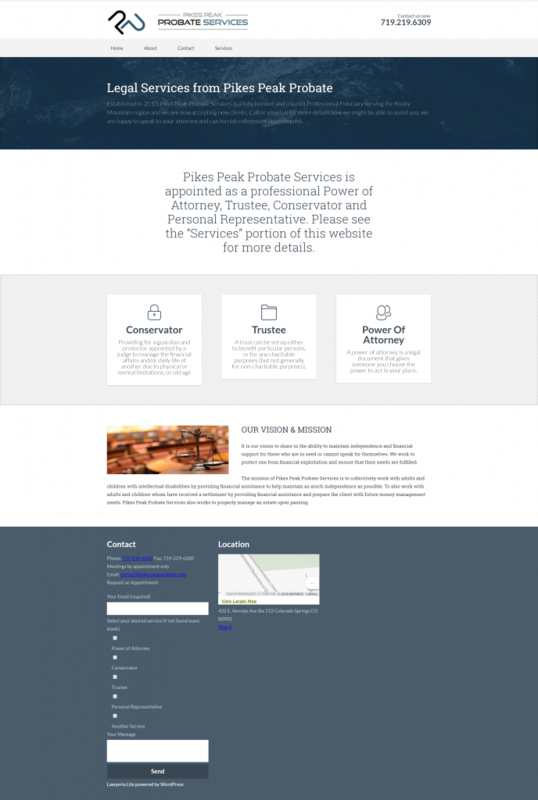 Pikes Peak Probate Services is a full service probate business with contracts in Colorado from the state and local courts. Established in 2010, they are a fully bonded and insured Professional Fiduciary serving the Rocky Mountain region. JSRashkin consulting created a new branding and web presence for this business and launched the new site and services for them after consulting on SEO, audience targeting, and branding. The logo was selected from 3 final designs to portray a responsible fiduciary establishment and to engender trust. The logo also provided a “icon” or reduced version that could be used for web and digital only products. The vertical version of the logo with icon. Used for business cards, company shirts, and promotional items. The company website was modeled after banking and other financial institutions to exude the kind of static, moneyed, security that is the foundation of probate and other financial legal services.